Place 1/2 the tater tots on the bottom of the crock pot, that has been sprayed with Pam. Sprinkle 1/2 cup of the cheese and 1/3 of the bacon over top. Place chicken pieces on top. You could season with salt and pepper but I didn't, as my chicken breasts came pre-seasoned. Place another layer of 1/2 cup of cheese and 1/3 of the bacon crumbles over top. 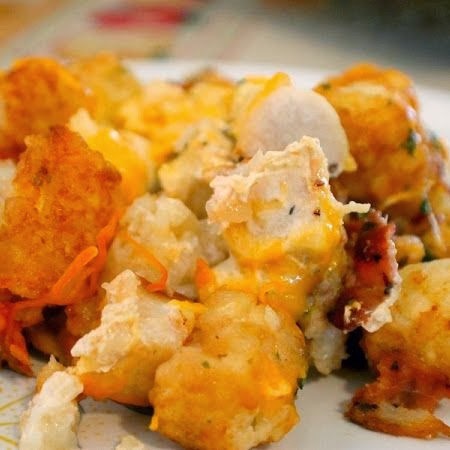 Place another layer of tater tots on top and cover with remaining cheese and bacon crumbles. Mix the milk with the dry seasoning mix and pour over top. I baked mine in the crock pot for 1 hour on high and then turned it to low for an additional 3. Please be sure to keep an eye on your own while its cooking as different sized crock pots and makes and models cook differently. Yours might be just fine at 4 hours on low.